The introduction of technologies into the teaching and learning environment has implied changes to the way education plays out in an eEnvironment. Previous research has highlighted the many barriers and challenges in integration technology into teaching and learning. Technology is said to be underutilised. However there are studies that have identified that teachers are using technology in their work. Little is known about the extent of this use of technology. Accordingly less is known about teachers’ eLearning practices. Osman Sadeck’s doctoral research seeks to highlight patterns in teachers’ eLearning practices. 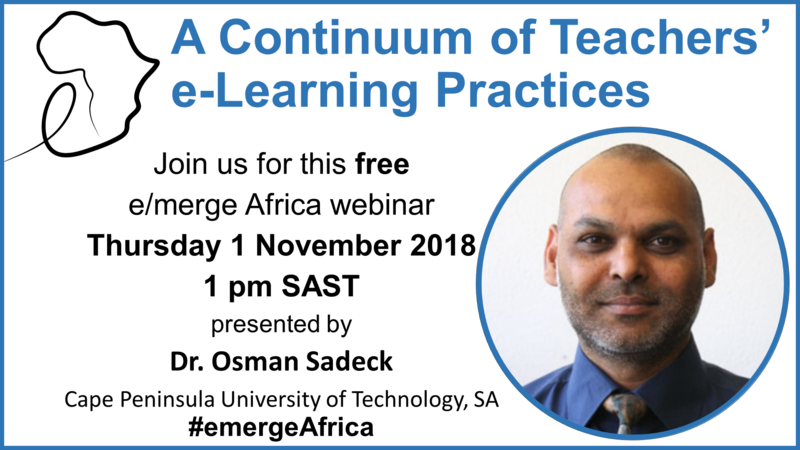 In this webinar, Osman will share insights from aspects of his doctoral study (which informed the paper linked below) of teachers’ e-learning practice where findings revealed that teachers’ development and progress in using technology for educational purposes can be located on continuums of adoption, use and practice. The webinar and the article linked below (authored with supervisor Johannes Cronjé) focuses on the continuums for use and practice. Using a blend of inductive and deductive techniques data was collected from a sample of teachers known to be using technology in their work. The study was framed by the: (i) Development in use and stages of teaching and learning with technologies (UNESCO) and (ii) Technological skills developmental levels (DoE). The data from the study has highlighted patterns in the use and practice of technology integration in school education. These patterns could be mapped to continuums of use and practice. It has been found that teachers used technology for a variety of purposes: personal, administration, teaching and learning at different frequencies and at varying levels of intensity. Teachers were found to use technology for eTeaching and eLearning progressively and in ways that was aligned to their comfort zones. The way teachers’ used technology was found to be progressive from simple to innovative. Sadeck, O. and Cronjé, J. 2017. A Continuum of Teachers’ e-Learning Practices, The Electronic Journal of e-Learning, 15(5): 396–409. 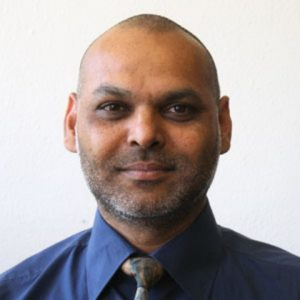 Dr Osman Sadeck is a Post-Doc Researcher and overall Project Manager at the Cape Peninsula University of Technology (Cape Town, South Africa) for the Assessment for Learning in Africa (AFLA) project. Dr Sadeck has served as lead and as member on various committees developing the South African school curriculum for ICTs in Education, Engineer Graphics and Design and Technology Education in the past 20 years. Dr Sadeck holds a MEd (e-Learning): University of Technology Sydney and a DTech: Informatics (e-Learning): Cape Peninsula University of Technology. His research field is e-Learning and ICTs in education with a focus on the practices of teachers.